It is always fun to be in a group when two people suddenly discover that they share a birthday. Should we be surprised when this happens? Asked a different way, how large a group of randomly selected people is required to have at least a 50% probability of having a birthday match within the group? I posed this question to both of my sections of AP Statistics in the first week of school this year. In a quick poll, one section had a birthday match–two students who had taken classes together for a few years without even realizing what they had in common. Was I lucky, or was this a commonplace occurrence? Intrigue over this question motivated our early study of probability. The remainder of this post follows what I believe is the traditional approach to the problem, supplemented by the computational power of a computer algebra system (CAS)–the TI Nspire CX CAS–available on each of my students’ laptops. If there were 2 people in a room, there was only 1 possible birthday connection. If there were 3 people (A, B, and C), there were 4 possible birthday connections–three pairs (A-B, A-C, and B-C) and one triple (A-B-C). For four people (A, B, C, and D), they realized they had to look for pair, triple, and quad connections. The latter two were easiest: one quad (A-B-C-D) and four triples (A-B-C, A-B-D, A-C-D, and B-C-D). For the pairs, we considered the problem as four points and looked for all the ways we could create segments. That gave (A-B, A-C, A-D, B-C, B-D, and C-D). These could also occur as double pairs in three ways (A-B & C-D, A-C & B-D, and A-D & B-C). All together, this made 1+4+6+3=14 ways. This required lots of support from me and was becoming VERY COMPLICATED VERY QUICKLY. Two people had 1 connection, 3 people had 4 connections, and 4 people had 14 connections. Tracking all of the possible connections as the group size expanded–and especially not losing track of any possibilities–was making this approach difficult. This created a perfect opportunity to use complement probabilities. While there were MANY ways to have a shared birthday, for every sized group, there is one and only one way to not have any shared birthdays–they all had to be different. And computing a probability for a single possibility was a much simpler task. 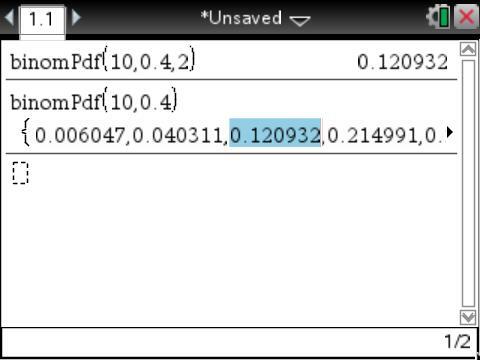 The probabilities were small, but with persistent data entry from a few classmates, they found that the 50% threshold was reached with 23 people. 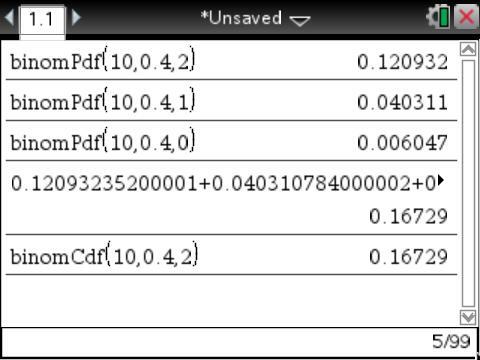 It was much simpler to plug in values to this simplified equation, confirming the earlier result. Not everyone saw the “complete the factorial” manipulation, but one noticed in the first solution the linear pattern in the numerators of the probability fractions. While it was easy enough to write a formula for the fractions, he didn’t know an easy way to multiply all the fractions together. He had experience with Sigma Notation for sums, so I introduced him to Pi Notation–it works exactly the same as Sigma Notation, except Pi multiplies the individual terms instead of adding them. 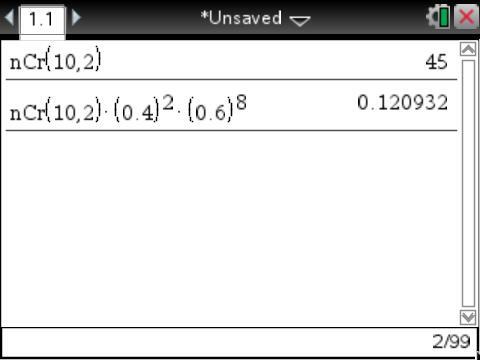 On the TI-Nspire, the Pi Notation command is available in the template menu or under the calculus menu. I really like two things about this problem: the extremely counterintuitive result (just 23 people gives a 50% chance of a birthday match) and discovering the multiple ways you could determine the solution. Between student pattern recognition and my support in formalizing computation suggestions, students learned that translating different recognized patterns into mathematics symbols, supported by technology, can provide different equally valid ways to solve a problem. I wasn’t guaranteed a match, but the 58.4% probability gave me a decent chance of having a nice punch line to start the class. It worked pretty well this time! 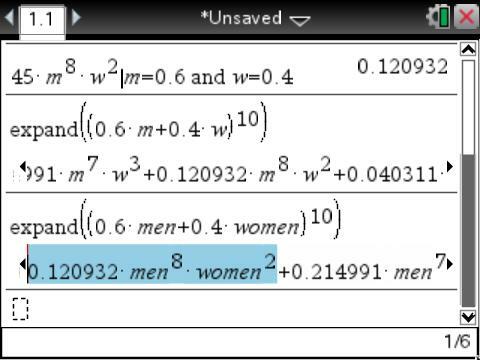 My students are currently working on their first project, determining a way to simulate groups of people entering a room with randomly determined birthdays to see if the 23 person theoretical threshold bears out with experimental results. I was pretty excited yesterday when the latest issue of NCTM’s Mathematics Teacher arrived in the mail and the cover story was an article I co-wrote with a former student who’s now at MIT. 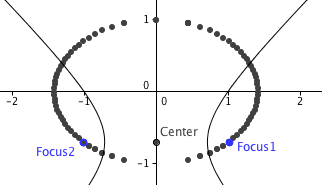 The topic was the finding and proof of a cool interconnected property of the foci of hyperbolas and ellipses that I made years ago when setting up my TI-Nspire CAS to model conic sections via the polynomial definition. After pitching the idea to teachers at professional conferences for a couple years with no response, I asked one of my 9th grade students if she’d be interested in a challenge. Her eventual proof paralleled mine, and our work together enhanced and polished each other’s understanding and proofs. While all of the initial work was done with the TI-Nspire CAS, we wrote the article using GeoGebra so that readers could freely access Web-based documents to explore the mathematics for themselves. You can access the article on the NCTM site here. While a few minor changes happened after it was created, here is a pre-publication proof of the article. 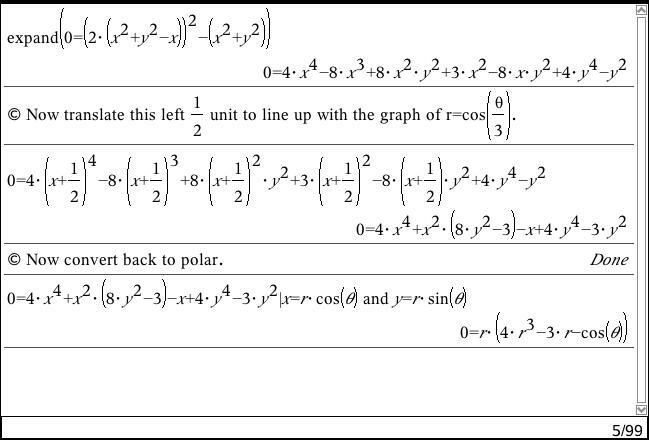 The following question about how to compute derivatives of polar functions was posted on the College Board’s AP Calculus Community bulletin board today. 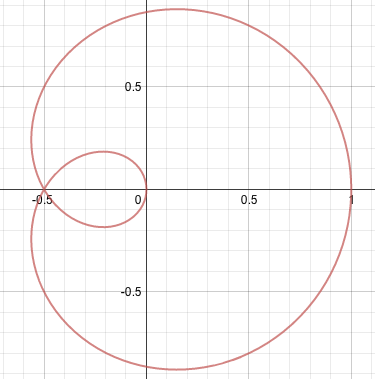 From what I can tell, there are no direct ways to get derivative values for polar functions. 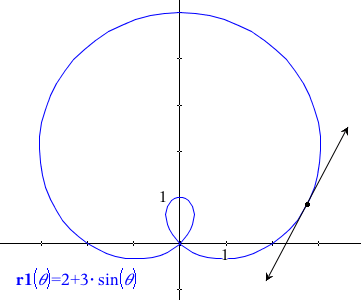 There are two ways I imagined to get the polar derivative value, one graphically and the other CAS-powered. The CAS approach is much more accurate, especially in locations where the value of the derivative changes quickly, but I don’t think it’s necessarily more intuitive unless you’re comfortable using CAS commands. For an example, I’ll use and assume you want the derivative at . Remember that a derivative at a point is the slope of the tangent line to the curve at that point. 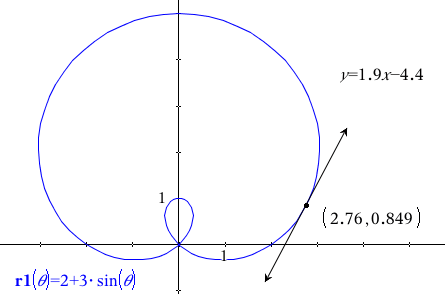 So, finding an equation of a tangent line to the polar curve at the point of interest should find the desired result. 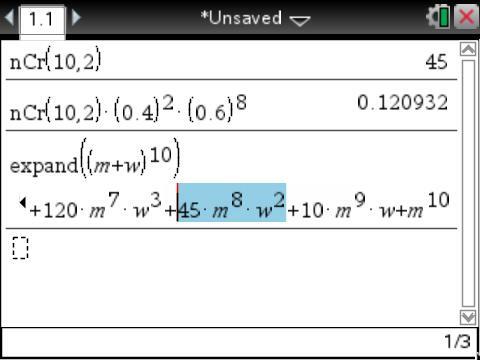 Create a graphing window and enter your polar equation (menu –> 3:Graph Entry –> 4:Polar). 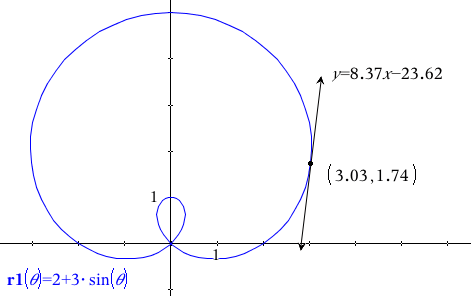 Then drop a tangent line on the polar curve (menu –> 8:Geometry –> 1:Points&Lines –> 7:Tangent). 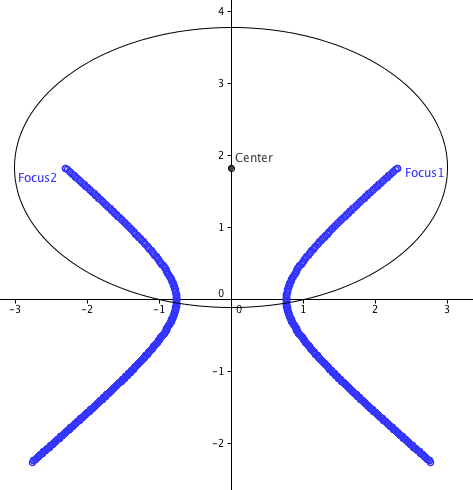 You would then click on the polar curve once to select the curve and a second time to place the tangent line. Then press ESC to exit the Tangent Line command. 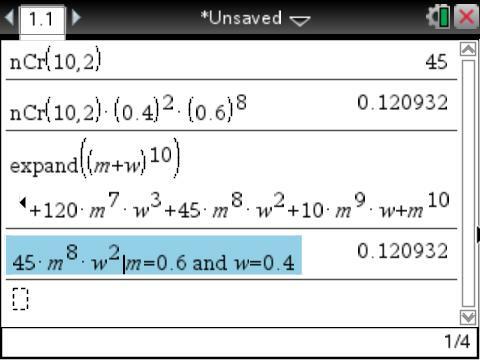 To get the current coordinates of the point and the equation of the tangent line, use the Coordinates & Equation tool (menu –> 1:Actions –> 8:Coordinates and Equations). Click on the point and the line to get the current location’s information. After each click, you’ll need to click again to tell the nSpire where you want the information displayed. So the x-coordinate is . 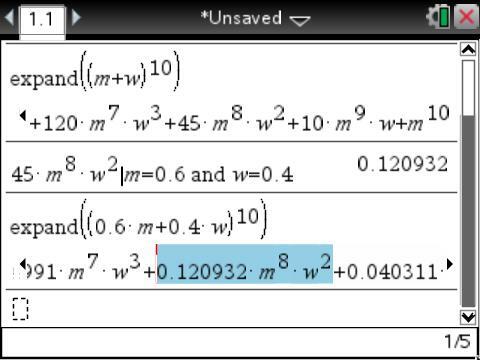 Drag the point to find the approximate slope, . 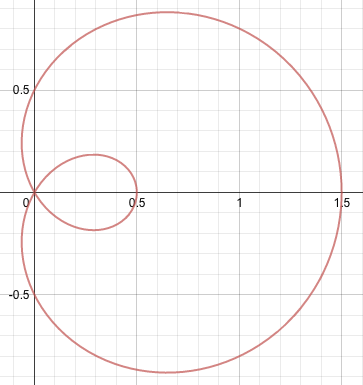 Because the slope of the tangent line changes rapidly at this location on this polar curve, this value of 8.37 will be shown in the next method to be a bit off. Unfortunately, I tried to double-click the x-coordinate to set it to exactly , but that property is also disabled in polar mode. 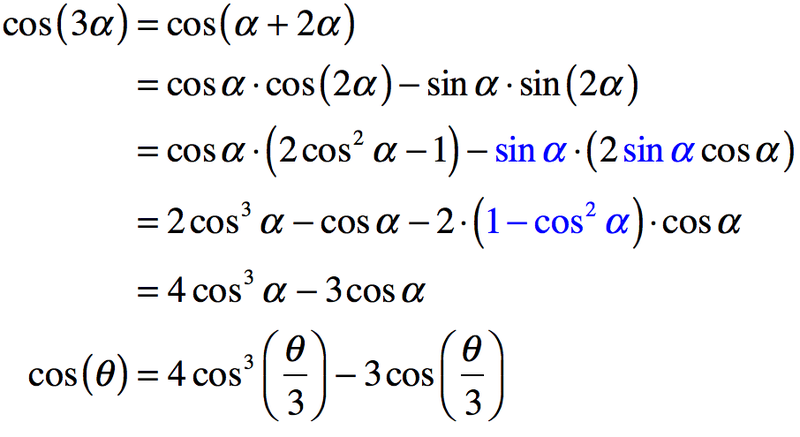 Using the Chain Rule, . I can use this and the nSpire’s ability to define user-created functions to create a polar differentiator for any polar function . 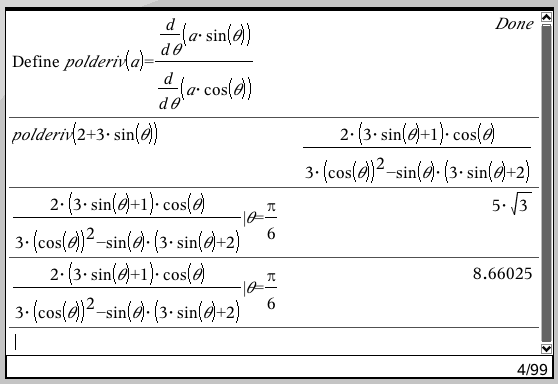 On a Calculator page, I use the Define function (menu –> 1:Actions –> 1:Define) to make the polar differentiator. All you need to do is enter the expression for a as shown in line 2 below. This can be evaluated exactly or approximately at to show . As with all technologies, getting the answers you want often boils down to learning what questions to ask and how to phrase them.